Damn! I forget my bucket. 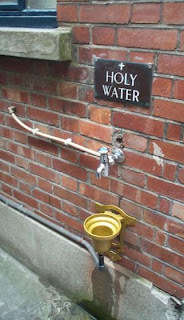 This is a convenient way of producing holy water -- just stick a label at the tap! Actually, blessed water are found in Chinese Buddhist temples as well. Most of the time these are bottled water with a sticker on it and placed at the alter for prayers. Once, while I was helping to stick the labels "Great Compassion Water" (大悲水), I wondered why is it necessary to stick the label. Any volunteer told me the devotees only take the bottles only if they are labeled. I guess the label makes all the difference.